Combine flour, oatmeal, salt, and xanthan gum. Cut butter into small bits and work into flour mixture until crumbly. Add egg and agave nectar. Mix thoroughly and if needed, add enough water (up to one tbs) to form a stiff dough. Roll dough between sheets of wax paper and place into 8 inch pie pan. Press in place, with dough coming about halfway up the side of the pie plate. Pit and slice plums. Arrange on oatmeal crust. Drizzle with agave nectar and sprinkle with cinnamon, cardamom and nutmeg. Top with bits of butter. 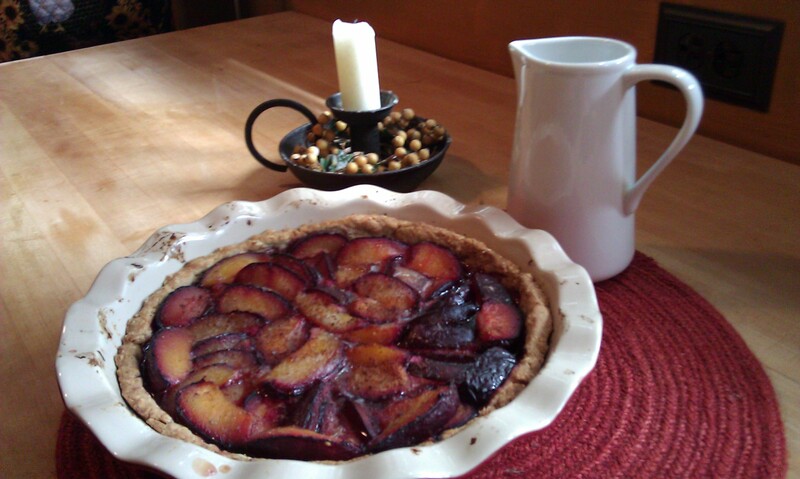 Bake at 350 for one hour or until the crust browns and the plums are bubbling. Let cool and serve with whipped cream.